November is Pancreatic Awareness Month, a time to raise awareness about this particularly lethal form of cancer. Pancreatic cancer has taken many lives, notably that of Apple founder Steve Jobs in 2011. It may not draw as much attention as breast cancer or lung cancer, but it’s the fourth leading cause of death in the United States. Each year, it kills over 37,000 people. Pancreatic cancer is rarely detected until it’s too late for surgery, making it incredibly deadly. All types of pancreatic cancer take lives on a daily basis. It’s killed many high profile individuals as well, including Steve Jobs, Nobel Prize winner Ralph Steinman, and actor Patrick Swayze. Like other cancers, pancreatic cancer occurs when cell division is out of control. Cancer can occur in different areas of the pancreas, and there are several subtypes. In most cases, it develops in the exocrine component of the pancreas, where digestive enzymes are produced. In around 1% of cases, however, the cancer occurs in neuroendocrine cells of the pancreas. This rare type of pancreatic cancer is what killed Steve Jobs. 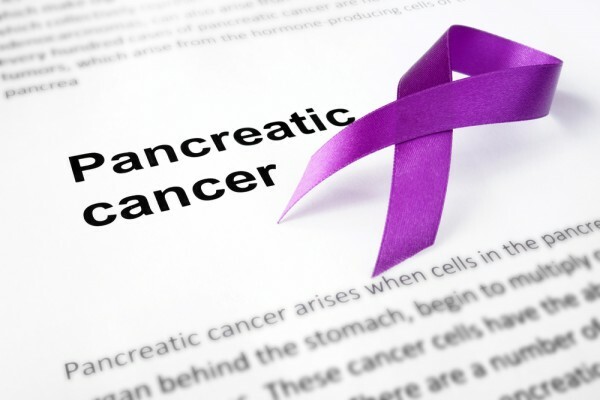 The most common type of pancreatic cancer is pancreatic adenocarcinoma, which accounts for about 85% of cases. This affects the pancreatic ductal epithelium, a very small area of the pancreas. Pancreatic cancers proceed in stages, which are identified with a CT scan. Stage T1: The cancer is less than 2 cm in size. Stage T2: The cancer is larger than 2 cm. Stage T3: The cancer has grown into tissues outside of the pancreas. Stage T4: The cancer has entered the blood vessels. Stage N1: The cancer has entered into nearby lymph nodes. Once it moves outside of the pancreas, the cancer often enters the duodenum, the stomach, the transverse colon, the spleen, the adrenal glands, or the kidneys. They can also spread into blood vessels and lymphatic vessels, which greatly complicates surgery. Surgery for pancreatic cancer can be performed if the cancer is found before it has the chance to spread outside of the pancreas. If the disease has spread, surgery may not be possible, and the person’s odds of surviving are very low. Only 20% of cases involve surgery for the purpose of curing the cancer completely. That means that 80% of the time, the cancer isn’t diagnosed until it’s already too late. Once the cancer has advanced, palliative care is the only real option. Pancreatic cancer creates few early symptoms, unlike many other cancers like lung cancer. This makes it harder to diagnose. The early symptoms it can create are quite vague and nonspecific, the kinds of things that are often dismissed as either psychosomatic or a minor illness. Upper abdominal pain, weight loss, and appetite loss are things that can stem from a wide variety of underlying problems. Because it’s rarely diagnosed before it spreads, pancreatic cancer is one of the most deadly forms of cancer. Pancreatic adenocarcinoma, the most common type, is known for its poor prognosis. Pancreatic neuroendocrine tumors, however, can often be relatively benign, and have a five year survival rate 16%.